Christopher Hinderliter is a Philadelphia personal injury lawyer who focuses his practice on helping individuals recover for the harm inflicted by others. His practice includes personal injury litigation, where he represents individuals in lawsuits involving construction accidents, medical malpractice, products liability, premises liability, and motor vehicle collisions; and commercial litigation, where he represents individuals and small businesses. Mr. Hinderliter is a graduate of King’s College where he received consistent academic honors while also playing intercollegiate football and lacrosse. He completed his legal education at Villanova University School of Law, where he earned accolades for his advocacy skills, including membership on the Executive Committee of the Moot Court Board. He won the best brief award in the 44th annual Reimel Moot Court Competition and advanced to the quarterfinal round in that same competition. 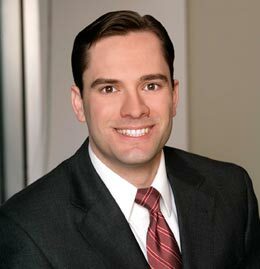 Mr. Hinderliter gained extensive experience throughout law school while working with a prominent Philadelphia plaintiffs’ law firm. Mr. Hinderliter also devotes his time to providing free legal and social services for underprivileged and mistreated members of society. He is an active volunteer with the Support Center for Child Advocates where he works as the attorney and guardian ad litem for abused and neglected children. Mr. Hinderliter is admitted to the bars of Pennsylvania and New Jersey and to the United States District Courts for the Eastern District of Pennsylvania and the District of New Jersey. He is a member of the Pennsylvania Association for Justice, the Philadelphia Trial Lawyers Association, and the Philadelphia Bar Association.